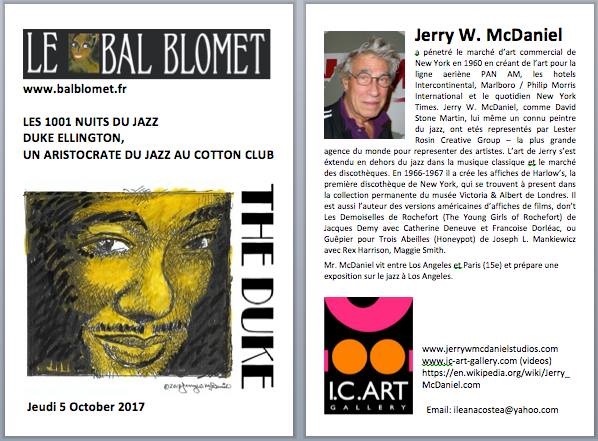 Ad campaign (September 19 – October 5, 2017) by Jerry W. McDaniel (art agent Ileana Costea) for Le Bal Blomet – Cabaret d’Art in Paris/Montparnasse (“15ème arrondissement” consisting of two large posters and a post card. “Three women dancing” at a cabaret-like revue show at Le Bal Blomet. The painting was created in a pop-surrealist way to reflect the surrealistic movement of the artists who frequented the place between the two World Wars. show of October 5, 2017 dedicated to Duke Ellington. Poster. Media: PMT markers and collage. 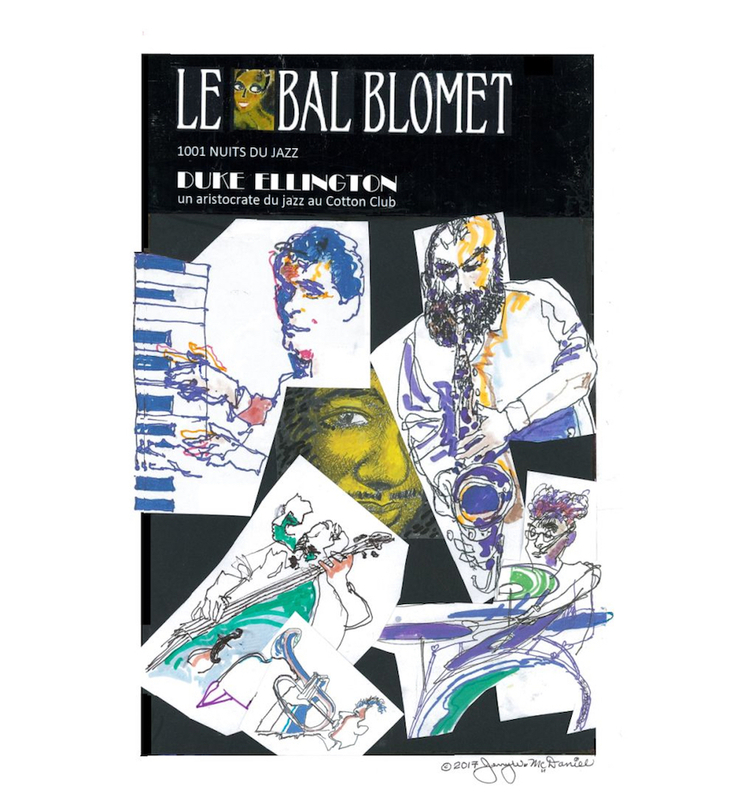 While in Paris last summer (2017) we, artist Jerry W. McDaniel and I (Ileana Costea, I. C. ART Gallery Director), discovered a place where, two Thursdays a month, there are jazz shows: Le (The) Bal Blomet at 33 on Blomet Street (rue Blomet) in Paris 15th – Montparnasse. It is located at 4 minutes walk from where Jerry’s studio is in Paris, on rue Lecourbe. We got interested in the place because we both like jazz, but also because it had a strong art element into its history. It used to be frequented by surrealist painters, sculptors and writers… They came to talk, have a drink, listen to music, and dance. During the “Crazy Years” /”Les Annees Folles”, between the two World Wars, the surrealist group had studios a few houses down the street at No. 45 rue (street) Blomet. A plaque placed by the City of Paris announces that there is the place where the surrealist movement took birth. In those days it was called Le Bal Negre. Many black musicians from the Caribbean were performing there. It is said that Josephine Baker played there too. Brasai, a famous photographer, took several photos there (one is to be found at LACMA Museum in Los Angeles). For more details on the place look at the link (in English): http://www.balblomet.fr/the-fabulous-destiny-of-the-bal-blomet. For many years it was closed, and in March 2017, after about four years of remodeling it was reopened. The owner, Mr. Guillaume Cornu, a musician himself, named it by its old-well-known name: Le Bal Negre. The place was so famous during “The Crazy Years” that telling a taxi driver that you wish to go to 33, they would not where to take you. Politically-correct conscious Parisians demonstrated against this name, and the owner changed it to Bal Blomet (after the name of the street it is on). Numerous articles in important Parisian papers made the place known again. The shows are sold out every evening. At my (Ileana Costea’s) suggestion Jerry started to work on an ad campaign for Le Bal Blomet. We got in touch with the owner. A portfolio with Jerry’s numerous previous jazz art and a draft of a jazz poster dedicated to Bal Blomet, convinced the owner. Jerry was supposed to design a poster for the evening of October 5th, dedicated to Duke Ellington music. Another good reason for an American Artist to work on this campaign. 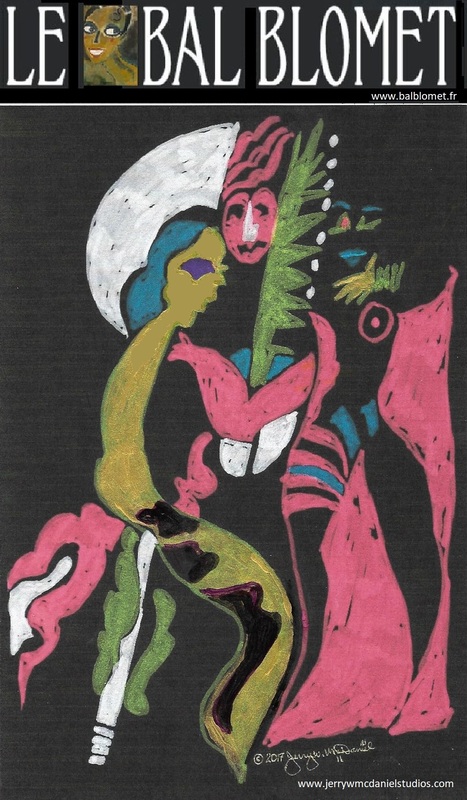 Finally two posters were created, the “Musicians at Bal Blomet” poster, another pop-surrealistic one, “Three women dancing”, to reflect the Cabaret-like Reviews played there, dedicated to Duke Ellington. The owner also suggested the creation of a postcard to be placed on all tables in the hall with a brief introduction of the artist. The time we had to create the art was short (and I saying “we” because I worked in my turn in support of Jerry. I was the agent who made all arrangements with the owner, I then starting making suggestions to the artist about what the posters might show, and finally doing all the computer work: looking for pictures of Duke Ellington, and the 5 musicians who played the evening of October 5, printing them, looking for more pictures until the artist felt that he has what he needs to draw the musician, making the changes in size: for the poster, and enlarging two of the drawings since they played a more important role in the show: the pianist and the saxophonist.